Das stimmt so aber in Deutschland haben die Folgen eine andere Reihenfolge. 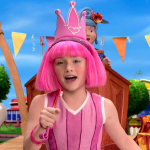 There are 18 episodes of LazyTown Season 2, not 14. Your TV station has mixed up the order and forgot episodes. That's a shame..
You better stick to this order of episodes, it's universal. I was not ready yet. But now it is complete. In the order it is shown here in Germany.